The Rice Experiment opened more than a few teenage eyes on how their words and intentions impact their environment. Hopefully, the lesson will translate into their homes and future workplaces. The middle school teens at our spiritual community conducted the Rice Experiment. After cooking a pot of rice, they placed a scoop of rice into separate, identical jars and sealed the lids. On the outside of one jar, they wrote “LOVE” while on the other jar they wrote, “HATE.” For the next week, they talked to the jars filling the LOVE jar with kind, loving, compassionate intentions and thoughts. They told the HATE jar it was stupid, ugly, mean and nasty. Then, they watched the results. A year later, these same jars sit on the shelf of our teen room, telling the story of our intentions. 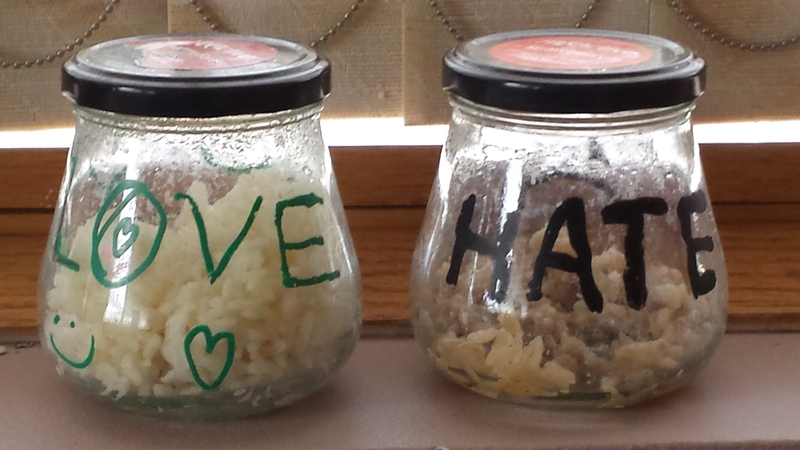 The LOVE jar, filled with our divine, loving intentions, remains filled with white fluffy rice. The HATE jar started decomposing right away and quickly turned into a grey, slimy sludge. No kidding. Vibrating energy patterns make up everything in the Universe – even your thoughts. The vibration of your thought patterns affects the environment around you. That phenomenon caught me unaware in my early 20’s. A boyfriend had given me a lovely, potted, flowering plant which flourished under my tender care. As soon as the boyfriend dumped me, the plant died. “I’m sorry little flower. I didn’t mean to kill you!” My negative thoughts about the giver of the plant had created a toxic environment in which the plant could not thrive. How many times have you been in a toxic work environment where your life force felt jeopardized? Other peoples’ toxic thought vibrations set up a dissonance in your personal space. The complaining and whining can bring your vibration down until it affects your physical health – like the decomposing HATE rice jar. The Good News: we control our own thoughts! Sweet! I don’t have to send out negative thought vibrations that ricochet into someone else’s negative thoughts adding to the cesspool of toxic emissions circulating through the office or home. I can choose to think positive, loving, kind, compassionate thoughts. How do you get the train rolling down a different track once it’s in motion down the track of negativity? Switch tracks! Toggle the screen of your awareness to a new thought. Find something to appreciate: your amazing hand, the song on the radio, a color, a shadow pattern, a shimmering light. Toggle. But she said …. toggle… but they did that to me… toggle, toggle, toggle. Appreciation changes the vibration of your thoughts to an upward spiral. You don’t have to switch to the JOY track right away. Switching from complaining to joy might require too big of a leap. Sometimes, when I am really mad, the best I can do is get to neutral. At least in neutral, you are not adding to the negative cesspool. From neutral, take one small step in the direction you want to go. Appreciate one thing. Then another. Then appreciate ten things. Notice any positive change in your environment. You might not notice a change in people around you right away, but keep it up and you will. Guaranteed. Research by Dr. Masaru Emoto provides more elegant evidence than our rice jar experiment about the effect of thought vibrations on your environment. Dr. Emoto led a team of researchers to photograph frozen water crystals. Emoto found that frozen water crystals from a beaker labeled with positive words – love, joy, Mother Theresa – or submitted to healing music, created symmetrical crystal patterns that look like beautiful snowflakes. Frozen water crystals taken from a beaker of polluted water, however, or one labeled with hateful words or submitted to heavy metal music, produced crystals that looked asymmetrical, broken, dark, cloudy and misshapen. Even more importantly, Emoto’s team found that the broken crystal structure of the polluted water could be repaired. Misshapen water crystals became symmetrical and beautiful again when infused with loving, kind intentions – prayer therapy. Now we know why prayer works on our bodies. The human body is over 50% water. When we pray over the body, the water molecules respond to the higher vibration thoughts. Other researchers, notably Dr. Larry Dossey, have shared research on the power of prayer in medical situations. Researchers documented that patients’ health improved when someone prayed for them – even when the patient did not know of the prayer. Harnessing the power of your thoughts – toggling from a negative to a positive thought – will help you achieve your dreams and create an environment where you flourish. Try sending thought vibrations for harmony and wellbeing to the people around you to help foster a more harmonious work and home environment. When we humans learn to collectively harness the power of our shared vision, we will create a world that we DO want where all creation can thrive and prosper. Please join me in toggling to a life that includes more love, peace, freedom, harmony, prosperity and joy.